Tim Noble and Sue Webster have just won the Object of the Year Award at Masterpiece London for their work, The Masterpiece, on Blain|Southern’s stand. The following interview with Sue Webster, first published in Masterpiece London magazine 2014 in association with Apollo, offers some insight into their ideas and working methods. 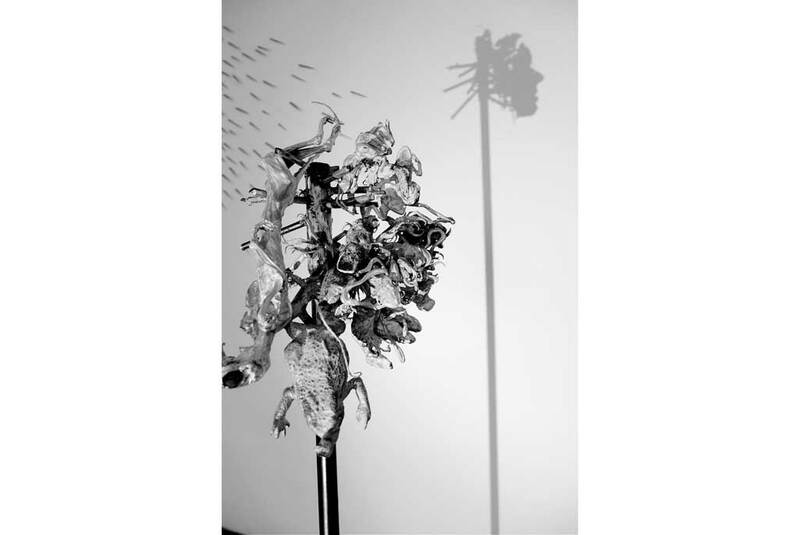 British artists Tim Noble and Sue Webster have received widespread acclaim for their shadow sculptures, which transform seemingly abstract assemblages of objects, such as household rubbish, into figurative shadow portraits. 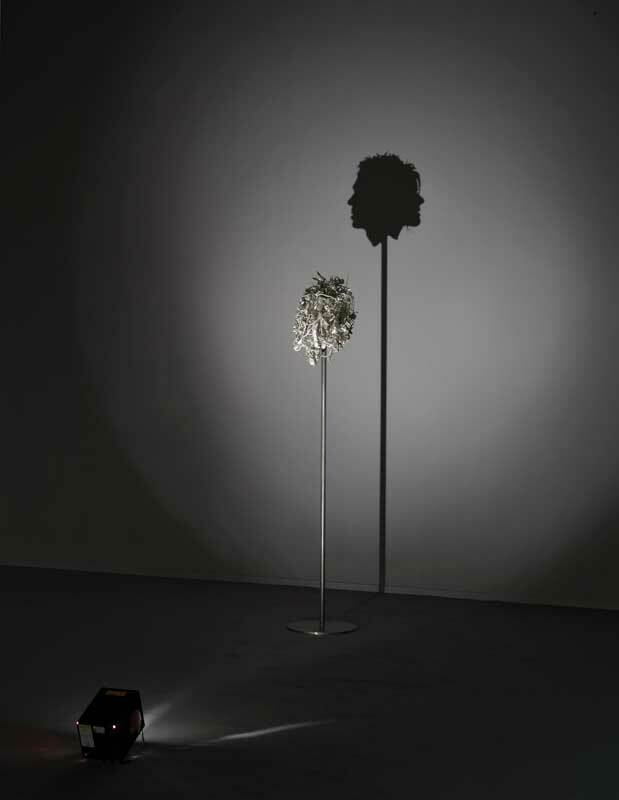 For Masterpiece London 2014, they have created…one of the most ambitious shadow pieces they have produced to date. We caught up with Sue Webster as the work neared completion. Can you tell us about the work you’re showing at this year’s Masterpiece London? Blain|Southern decided to present a single artist on their stand at the fair this year, and asked us to come up with ‘a masterpiece’. That’s a bit like asking a comedian to come up with a joke on the spot! I went away and thought that for this fair, it needed to be something that looked very smart – in contrast to a lot of our work, which is made of trash. 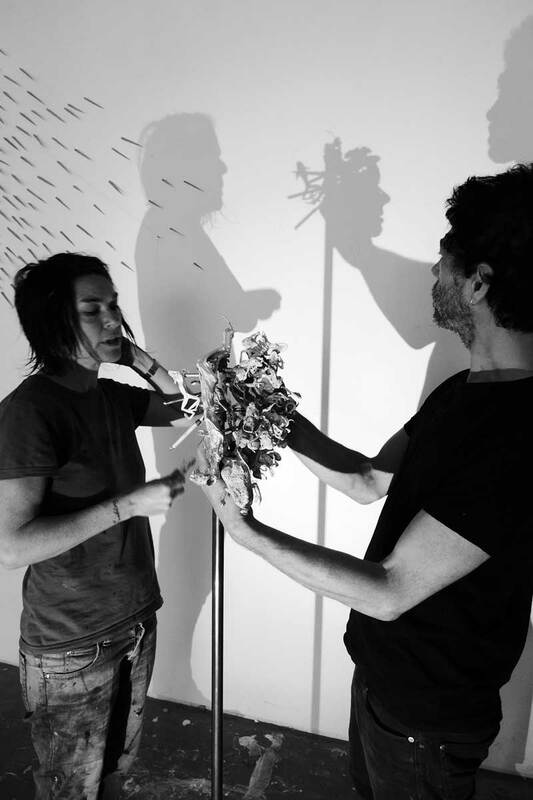 So we’re making a shadow piece out of silver, a portrait of Tim and me. It’s made up of an accumulation of objects: when you shine a light on it, it’ll cast a perfect, classical profile of the two of us on the wall. The individual elements are casts of dead vermin we’ve collected together over a period – creatures we’ve found, rats and frogs and squirrels, some of which we’d found in the countryside, some of which our cats had brought in as gifts. We’ve welded them together into a ball of creatures. From afar you’ll be drawn to the shining, glistening silver, but when you look at it closely, it’s quite disturbing – like a menagerie of death. You’ve used similar animal casts before, haven’t you? We’ve used casts of most of these creatures before, but there’s a new element here. I went to Brazil this year, where I stayed with a shaman in the rainforest and tried ayahuasca – a hallucinogenic brew made from plant extracts. The shaman had seen our work in London and presented me with a tiny dried snake that he’d found at the bottom of the ayahuasca pot, which I managed to bring back and cast. You’ve called this work The Masterpiece. What do the words mean to you? You’ve got to aim pretty high to reach something that you’d consider to be a masterpiece. At first it was quite arbitrary – we provisionally titled it The Masterpiece because it was the work we were making for the fair, but when we actually tried to come up with a title, it had kind of stuck. I suddenly thought ‘this is a masterpiece, though I say it myself!’ We’ve really laboured over it. This is the first time you’ve made a large piece from silver. Has the material presented particular challenges? We’d made a shadow sculpture in gold before [The Gamekeeper’s Gibbet, 2011], which we exhibited in Berlin, so we had some familiarity with working in precious materials. But we never showed that in London, and I wanted a chance to give a London audience something similar. For the gold sculpture, we made a wax model first, then cast the piece in silver before dipping it in gold. But we’ve approached this in an entirely different way – this time we’ve cast the little creatures in silver directly, then welded them together. We’ve been making jewellery for the past 10 years, so we have worked with silver before – but never on this scale. With jewellery you solder, but this is welding with silver wire. We’re working with a silversmith in the studio…we’ve kidnapped him for a month! Your shadow sculptures seem to have strong art-historical precedents: Archimboldo’s composite heads; Jan Švankmajer’s animations. How important is that tradition to you? I didn’t know Archimboldo when we started – it wasn’t as if we’d studied him at art school then went to replicate what he was doing in three dimensions. These sculptures came from somewhere completely different, from trial and error in the studio. When we’d been working this way for three or four years, Norman Rosenthal came around our studio and said that we must have seen Archimboldo – I’d never heard of him! When we discovered his work, we went to the Louvre to look at it. They’re beautiful and I’d love to own one. There’s a cabinet of curiosities feel to these pieces too. Are you collectors yourselves? We collect materials. We’re always picking up things off the street in Shoreditch, where our studio is. Bits of furniture, a nice pair of stepladders…the studio is full of interesting things I know will be useful one day. I do collect art, but normally pieces I’ve swapped with other people. Most of my neighbours are artists. Do you feel you’re part of a resurgence of portraiture? has done. After a while you get a bit fed up with doing the same thing. You want to break it up, throw a spanner in the works when it’s going really well. What are your next projects? More shadow sculptures, or a change of direction? At the moment, The Masterpiece has taken over the studio. But what we have been experimenting with is painting and drawing, something that neither of us has done for a long time. It feels so instant compared to labouring over sculpture – both of us have trained ourselves to think that you really have to suffer before you’ve finished the work of art. There’s something free about painting and drawing again. Masterpiece London takes place in the South Grounds of the Royal Hospital Chelsea, London, from 26 June–2 July. This interview was first published in Masterpiece London magazine 2014, in association with Apollo.